Part Used & Method for Pharmaceutical Preparations: The fresh bone is dried in the shade, and then pounded into small pieces or soaked in wine or made into pills or powder. Functions: 1. To dispel wind and dampness and stop pain; 2. To strengthen tendons and bones. 1. Wind-damp obstruction syndrome manifested as rheumatic pain, spasm of the limbs and motor impairment of joints. 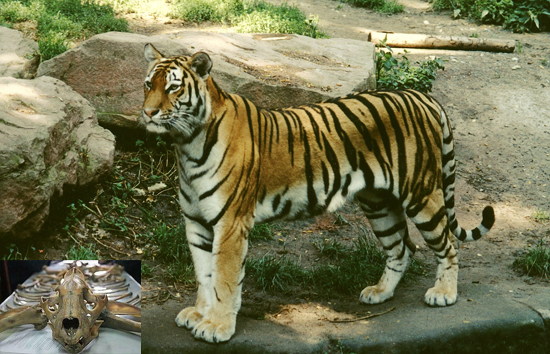 Tiger's bone (Hugu) is used with Chaenomeles fruit (Mugua), Cyathula root (Niuxi), Mulberry twigs (Sangzhi), Acanthopanax bark (Wujiapi) and Teasel root (Xuduan) in the formula Hugu Mugua Jiu. 2. Deficient liver and kidney manifested as fragile bones and tendons and weakness of the limbs. Tiger's bone (Hugu) is used with Cyathula root (Niuxi) and Prepared rehmannia root (Shudihuang) in the formula Hu Qian Wan. Dosage: 3-6 grams in pills, tinctures or powders (Chen). Contraindications and Cautions: Use with caution in cases of Fire from Excess or Deficiency.